Europe is on the brink of a potentially lethal crisis. A dozen years after the start of the European Monetary Union (EMU) the system is in troubled water and the political leaders, blinded by an anti-government ideology are steering the boat towards some dangerous rocks and risk the end of a long and peaceful ride in a formerly war torn region. Much has been said about the folly of pushing countries to cut public expenditure, increase taxes and put pressure on wages in the middle of one of the deepest recessions in modern history. However, even the outspoken critics of this approach rarely go to the core of the matter and discuss the long established economic policy strategy of the country that has come out of that recession like a phoenix from the ashes and is still celebrating its unique role and success. To the contrary, Germany is considered by many as the role model for the rest of the union. That is the biggest mistake and the real reason why Europe is committing economic suicide instead of tackling its problem at the root. Since the end of Bretton Woods, Germany’s economic policy has been based on two main pillars: competition of nations – the new mercantilism and monetarism. Both are irreconcilable with a monetary union of the European size. Firstly, a monetary union is in essence a union of countries willing to harmonize their rates of inflation and to sacrifice national monetary policies. A country like Germany, fighting for higher market shares in international markets, tries to achieve the opposite. It has to undercut the cost and price level of its main trading partners even if it violates the commonly agreed inflation target. Secondly, a large monetary union formed by already closely integrated countries becomes a rather closed economy and needs domestic policy instruments like monetary policy to stimulate growth time and again. German monetarism asks for the opposite, the absence of any discretionary action of central banks and relies solely on flexibility of prices, in particular wages. This is particularly tragic as the monetary union was an excellent economic idea and its foreseeable failure will prevent many useful attempts in the future to replace the vagaries of the financial markets in the determination of exchange rates by an orderly adjustment of the value of currencies to the fundamentals. But the best idea is useless if its protagonists and those politicians putting it into practice fail to understand it. Insofar the history of the euro is the history of a misunderstanding. From the very beginning neither the European Commission (EC) nor the European Central Bank (ECB) were up to their task of controlling the core of the system effectively. Eventually, this is the result of the failure of mainstream economic thinking. The crucial institutions were misled in their attempt to form a union with diverging economic concepts instead of designing a new economic policy strategy for all. They began to realize their failure only in the face of the crisis – but now the time is running out for successful changes to save the euro. The core of a monetary union is an agreement of all member States about a common inflation target. A monetary union is not a union of harmonized public budget targets or of harmonized holiday length. Unfortunately, many of those who were in favor of the monetary union had an unbalanced view concerning the constitutional elements of a currency union and still have. The focus of the European Commission and many member states on government deficits and public debt was driven by the overwhelming neoliberal agenda to minimize government and replace it by the private sector wherever possible. Consequently, they fine-tuned the rules for budgetary discipline time and again but ignored the massive divergence of prices, wages and unit labor costs even in the first years of EMU. But even today the deluge of comments on the crisis of the European Monetary Union overlooks the crucial inflation divergences and the huge external imbalance inside the monetary union. Greece’s budget problems and those of other southern members of EMU are a problem but they are closely related to external deficits. On the other hand, Germany’s sound budget position is to a large part the result of the huge external stimulus it got in the last decade. Spain is under scrutiny of the markets despite a strong budget position because its external deficit still is unsustainable. The key for the future of EMU, if there is any, is to be found in external adjustment in all countries and not in lopsided government’s belt tightening around the Mediterranean Sea. It is the external imbalances that will force the dissolution of EMU if strong corrective action is not taken soon. The imbalances ask for adjustment on both sides. If the surplus country refuses to become a deficit country, default of the debtor countries is unavoidable because a long and painful recession that would produce a surplus exclusively by falling imports is politically unfeasible. The logic to be applied is the logic of the transfer problem, the problem Mr. Keynes identified in 1919 concerning the dilemma created by reparations Germany was forced to pay for the war. Obviously, large parts of Europe have not yet understood that lesson and its political implications. This points to the roots of the misunderstanding. For the European commission as well as for the ECB, as strong believers in monetarism and free markets an approach based on a low but positive inflation rate enforced exclusively by monetary policy was extremely attractive. However, in reality the relationship of money to inflation is weak and even if it would be relevant it would only play at the level of the union as a whole. The most important determinant of inflation at the national and at the European level is unit labor cost growth (chart 1). The strong correlation of inflation and growth of unit labor cost creates a degree of freedom for monetary policy to stimulate the economy whenever needed. Unfortunately, the monetarist approach of the ECB prevented the use of it. By contrast, the main danger was overlooked. Persistent divergences of inflation rates inside the monetary union are fatal because the differences in the cost and price level accumulate over time and produce real exchange rate appreciation and depreciation and over- and undervaluation for countries without currencies. The solution for a monetary union to function properly is straightforward: nominal wages at the national level have to rise in line with national productivity in all member countries plus the commonly agreed inflation target. This implies that real wages at the national level grow strictly in line with the growth of national labor productivity. Given the strong mainstream belief in labor market and wage flexibility in Germany and the more lax attitude in Southern Europe a grave conflict was unavoidable. Since the start of the Union in 1999 Germany, the biggest country and the European stronghold of external stability for several decades had gone new ways to fight high and persistent unemployment. As work time reduction schemes and other measures had failed to bring unemployment down, in a tripartite agreement in 1999 even union leaders agreed to abandon the traditional formula basing wage growth on equal participation of workers in productivity growth and go for a strategy where productivity growth would be available to improve Germany’s competitiveness. The agreement resulted in a fundamental break with the German tradition of targeting a low and stable inflation rate. This new German labor market approach coincided with the beginning of the currency union and brought about the huge divergence in unit labor costs among the members of the currency union. After the start of the European Monetary Union (EMU) German unit labor costs, the most important determinant of prices and competitiveness did hardly rise any more (chart 2). On the other side, in most of the countries in Southern Europe nominal wage growth exceeded national productivity growth and the commonly agreed inflation target of two percent by a low but rather stable margin. France was the only country to exactly meet the agreed path for nominal wage growth perfectly; it was all the time in line with the national productivity performance and the inflation target of two percent. The “small” annual divergence yielded a huge gap over time. At the end of the first decade the cost and price gap between Germany and Southern Europe amounted to some 25 percent, and between Germany and France to fifteen percent. In other words, Germany’s real exchange rate depreciated quite significantly despite the absence of national currencies. The diverging growth of unit labor costs was reflected in similar price divergences. Whereas the union as a whole achieved its inflation target of two percent nearly perfectly, the national differences were remarkable. The huge gap in unit labor costs and prices had an enormous impact on trade flows. Germany’s exports flourished and its imports slowed down. Southern Europe and France ran into widening trade and current account deficits. While trade at the beginning of the currency union and in many years before was rather balanced, the first decade of EMU marks a period of rising imbalances. Even after the shock of the financial crisis and its devastating effects on global trade that hit German exports, in the years 2010 and 2011 Germany records a global current account surplus of 140 billion Euros per year and some 80 billion against the other EMU countries. By contrast, the deep recession and the austerity programs in the deficit countries tend to reduce the visible deficits but without a fundamental turnaround in competitiveness the countries lack the stimuli to revive growth. The lesson is simple: Absolute and accumulating advantages of one country against a similar country group are unsustainable. A huge gap in competitiveness has to be closed sooner or later. Failure to do so will create uncertainty on the side of lenders and tend to increase interest rates. As the final repayment of any debt has to be a payment in kind it requires the perspective that a debtor has a chance to generate current account surpluses sooner or later. If the creditors defend their surplus positions by all means default of debtors in unavoidable. In EMU wages in overvalued countries have to fall relative to those in the undervalued countries, which means a reduction of overall wages with major negative repercussions on domestic demand, growth and the inflation target in the union. If Southern European tries to regain competitiveness unit labor costs undercut the inflation target of the union for a long time and Germany’s ULC do not rise more than hitherto a deflation is the most probable outcome. The result is disastrous for Southern Europe. With German politics refusing to move in terms of higher wages for a protracted period of time they would need a number of years with absolutely falling wages to come back into the markets. However, the time to do that is not available as falling wages mean falling domestic demand and recession in the first place. In countries like Italy or Spain, with rather small export shares of some 25 percent of GDP, the depression resulting form falling domestic demand would not be politically bearable. One of the most intriguing discussions covering the last decades has been dealing with the competition of nations or the battle of nations on the field of trade. The age of globalization, more than any other before, has been interpreted as compelling nations to compete in similar ways as companies. The wealth of nations was considered to be dependent on the ability of nations to effectively adjust to the challenges that are created by open markets for goods and for capital. Nations with high standards in their capital endowment would be pressured by trading partners with low labor standards and the other way round. In particular the emergence of a huge pool of idle labor in developing countries like China and India would fundamentally change the capital/labor ratio for the globe as a whole in favor of capital and force the equilibration of low and high wages somewhere in the middle. Reality seems to have confirmed this view as wages in many high wage countries of the North got under pressure and labor did not succeed to appropriate the same share as capital of productivity growth, as had been the case many decades before. Wage shares are falling and the promise of advocates of market economies that full participation of all people in the progress of society at large would be possible is fading. However, the fact that wage shares are on the decline does not imply that the forces driving this move are those that the neoclassical model of the labor market refers to. Indeed, the political perception of pressure from emerging markets in many countries in the North was based on this model. A closer look reveals the limits and weaknesses of this approach. The model used is taken by analogy from the competition of companies. However, the model describing competition of companies does not apply to countries, and in particular not to countries with independent currencies. In a dynamic setting, market economy companies compete through the differentiation of productivity. The supply side conditions for all companies are normally given – market forces’ tend to equalize prices of intermediate goods like the price of labor and the price of capital. Consequently, success or failure is determined by the specific value that is added at the company level to the generally traded goods and services. Companies as price takers have to honor the price of labor determined on the market for the different qualities of labor that are offered as well as the price of capital. Companies able to generate higher productivity through innovation and new products produce at lower unit labor costs than their competitors, which will allow them to offer their goods at lower prices or make higher profits at given prices. The former means to gain market shares, the latter may mean strategic long-term advantages through higher investment ratios. As long as the prices of labor and other intermediary products are given, competitors adjust by implementing the same or a similar technology or by quitting the race through bankruptcy. At the level of countries this mechanism doesn’t apply because wages are normally set at the level of countries. Be it through mobility of labor at the national level or through wage negotiations in a national context, countries unlike companies are wage setters not wage takers. If wages are centrally negotiated at the level of the nation state or if labor is mobile the so-called law of one price, equal pay for equal work, has to be applied. Consequently, stronger growth of productivity at this level does not increase the competitiveness of all companies against the rest of the world as advantages in productivity are normally reflected in higher nominal wages (and real wages) and unchanged unit labor cost growth. But even if this mechanism, for whatever reason, would not work at all, a country with rather high productivity but extremely low wages and very low unit labor costs, would not automatically increase its competitiveness or the competitiveness of all its enterprises. The prices in a country using consistently wage-dumping policies to improve its competitiveness would not necessarily be lower than in the rest of the world expressed in international currency. In a world of national currencies and national monetary policy, a country supplying its goods at much lower prices would gain market shares and accumulate huge trade and current account surpluses. Political pressure to adjust wages and prices in international currency would mount and sooner or later the country would be forced to adjust its wages, measured in international currency, through a revaluation of its currency. Nations can open their borders for trade and capital flows if it is assured that their companies have a fair chance in the global division of labor and that they are not in danger of permanently losing out against the rest of the world. This is the simple proposition underlying all international arrangements about trade in the WTO and elsewhere. If, at the level of the overall economy, the nominal remuneration of the immobile factor in one nation state, labor, exceeds the effectiveness of its use (labor productivity) consistently by a wider margin than in the competing countries, the country is getting into trouble because most of its companies are in trouble. They have to ask for higher prices and accept the permanent loss of market shares or accept lower profits to avoid the loss of market shares. A situation like this, called an overvaluation due to an appreciation of the “real exchange rate”, is unsustainable and once the accumulated overvaluation reaches some twenty percent or so the crisis is unavoidable. The deficit on the current account is just the most visible indicator of the pathological constellation but not its core. In Europe Italy and Britain were facing such a problem as members of the European Monetary System in 1992; one opted in, one opted out, but both devalued. In systems of adjustable exchange rates, the solution is rather simple: the currency of the country in trouble has to devalue bringing the nominal wages and nominal unit labor costs measured in international currency back to a competitive level. Indeed, devaluation leads to a relative fall in real wages but that is not an important aspect of the analysis. In a currency union the member countries explicitly or implicitly agree not to go the inflationary way (nominal wages exceeding national productivity by more than an explicit inflation target) anymore or to go altogether. With an inflation target of close to two percent the implicit contract is that nominal wages do not rise more than national productivity growth plus two percent. This means that each country can and should enjoy its productivity increase, be it 1 percent like in Germany or 2 like in Greece, in terms of real wage growth or shorter working hours or both. At the same time each country is encouraged to do whatever needed to improve its productivity performance. The new mercantilism has been aiming at defending favorable competitive positions created by undervalued exchange rates or by very low wages in relation to productivity. However, this strategy has not been successful. In Germany it destroyed the dynamics of the domestic markets and provoked vulnerability of trading partners that will backfire on Germany. Nevertheless, there is always a risk that governments will use exchange-rate manipulation or wage compression, subsidies and lower corporate taxation to artificially improve the international competitiveness of domestic producers. This kind of “new mercantilism” has to be banned. All countries can simultaneously boost productivity, wages and trade to improve their overall economic welfare, but not all of them can simultaneously Improve their competitiveness and achieve current-account surpluses. Successive rounds of competitive devaluations or races to the bottom are counter-productive and likely to cause considerable damage. Therefore, the world economy needs a new code of conduct going far beyond the existing framework of international rules of trade policy and explicitly include national policies with huge repercussions on international markets. Good presentation. Makes clear what Soros and Yanis have been saying all along. Yup, this session, with Flassbeck, Stiglitz and the sharp contrast to Robert Walter was one of the highlights of the conference. But, let me highlight one more thing. Soros, when being asked for a solution to the banking crisis, he just stretched his arm to his right, and said “the concept from there is the right idea…”. Whom was he pointing to? Mr.Varoufakis! Yanis, enjoy the recognition. Flassbeck was a standout in the conference. However, he seems to represent a small and isolated minority of opinion which has become a persistent problem in this debate. Unless the minority(typically leftist, including Yanis), can convince the majority the situation appears equivalent to a hamster pet spinning its wheel inside its cage. The output of energy is great for the hamster(aka minority opinion hutchers), put due to the closed system of the cage the kinetic energy output is not producing anything. This again reminds of Plato’s Allegory of the Cave. Not only the great majority are cave dwellers in their own contrided environment of falsehood, but the dissenters are also put in a separate enclosure within the cave which is made out of pure granite, banging with their bare fists the cave walls under the false assumption that they might introduce change. In short, both groups are contemptable in this debate. The majority due to extreme ignorance and the minority due to extreme ineffectiveness. This again reminds of Plato’s Allegory of the Cave. Not only the great majority are cave dwellers in their own contrived environment of falsehood, but the dissenters are also put in a separate enclosure within the cave which is made out of pure granite, banging with their bare fists the cave walls under the false assumption that they might introduce change. Thanks for this, Yanis. Great insight! Excellent presentation! –> So to call for higher wages in Germany (Lagarde), even though I would like that very much, does not help. It only lowers German competitiveness against non EZ countries. Very interesting…especially if you take into account that 1)keeping german wages frozen for 10+ years was the cause of the internal trade imbalances in EU and 2) 2/3 of EU Trade is conducted inside the union and not with Japan or Turkey or US or China. The point is that you don’t want to be competitive to non-EZ nations. Why would you want to compete with labor in countries that have no human rights protection, like China, but increasingly the US also? If you only produce or offer as service what low wage countries offer, you automatically compete with them. Howmuch overlap do Swiss firms have with Greek firms, how much overlap does Greece have with Turkey (tourism anyone). The fact that Greece is too expensive resultet into reducing the market share of meditarian vacations by 50%! This is totally independent of German wages! If Germans had higher wages this would not only cause increased German tourists in Greece…thats totally nonesense.Higher wages would cause higher demand at the domestic market in Germany ie increased imports and larger portion of domestic production which would not be driven outside of Germany.This equals to increased exports from the rest of EZ to Germany and more room for export growth for the rest of EZ in general since German industry would not be so much export oriented. Its all about aggregates and you fail to get the point.If A spends money on B and B spends money on C then the more money A spends on B,the more B can spend on C.So even if A doesnt directly spend on C,an increase on its purchasing power affects C aswell…..
Let’s assume Silicon Valley segregated from the State of California to become an independent sovereign country. I don’t have figures but given the enormous success of Silicon Valley companies, I would expect the new Silicon Country to run up enormous current account surpluses. I would expect their new currency to appreciate enormously against the USD and that would, over time, reducte their exports to the rest of the world (and lower their standard of living). Silicon Valley cannot segregate. Does that mean that under the protection of the much cheaper USD, they are pursuing mercantilist strategies? Silicon Valley (Cali) already has surpluses vis-a-vis most of the other US of A…and these surpluses are being recycled.That way they are not creating problems to the rest of the states (which would eventually cause the dollar zone to collapse) so no mercantilist strategies can be implied. If this is an analogy between Germany and Cali and between US and Eurozone…then its a false one. Can we continue this theoretical case? (I am not arguing a point; I am curious about answers). Let’s assume that Silicon Valley is indeed a large surplus generator (as you also say). Now, I would assume that the living standard in Silicon Valley is light years away from that in parts of Alabama. One of the reasons that their living standard is so high is that they can sell their products throughout the world. Their products are very expensive (and profitable for them) but they can still sell them throughout the world because the USD is relatively inexpensive. Should they exit the USofA and create their own currency, that currency would skyrocket and cut into their sales and profits. Silicon Country could not do what Silicon Valley is doing. Is Silicon Valley causing problems for Alabama? Sure! If Apple sourced its iPads etc. from Alabama instead of China, there would be a lot more jobs, economic activity and living standard there. Now you say that Silicon Valley is recycling their surpluses throughout the USofA, thus, there is no mercantilism. Silicon Valley is far too small to spend all their surpluses on imports from the rest of the USofA, but they still recycle. How? Because they invest their surpluses in the rest of the USofA and the world. Apple has about 110 BUSD in cash and that cash is certainly not with banks in Silicon Valley. Germany is not spending enough of its surpluses on imports from the rest of the EZ. That’s not good. But Germany is recycling its surpluses all the same. Instead of buying products from the Periphery, they lend money to it. In the last 4 years, the Bundesbank has recycled over 600 BEUR to deficit countries. I don’t know where Apple is making its investments in plant and equipment but if they were making them in Alabama, the living standard there would rise. However, Apple will never invest to raise the living standard somewhere but only because there are attractive business conditions offered. If Alabama wants to increase its living standard (more jobs, more income), they have to figure out a way to attract investments from companies like Apple. The State of California won’t make those investments and neither would the Silicon Country make them. Alabama might find a way to attract mortgage money for sub-prime borrowers, thereby raising its living standard temporarily and artificially but when that bubble bursts, Alabama is worse off than it was before. The fact is that the high living standard in Silicon Valley is facilitated, among others, by the rest of the USofA. Wealth is transferred from the rest of the USoA to Silicon Valley and, in exchange, they get beautiful products. Wealth was transferred from Greece to Germany and, in exchange, Greece got submarines… (sorry about this punt). Again, this is a totally theoretical case but my point would be this: I understand the resentment against Germany but I am not sure what Germany could do which it isn’t doing. Unlimited Eurobonds? Taking over other countries’ debt? Fine, but it wouldn’t change the situation of unbalanced trade/wealth flows a bit. If the interest rate were lowered, that would provide some breathing space for the budget but it wouldn’t change the overall economic situation much. Only if German companies invested money in Greek plant and equipment to create jobs/incomes there would something positive happen but then we are back to the point what Alabama would need to do in order to get investment from Apple. Υes but that just happens to be actually true,its not granted.I mean China exports to USA,just like how Germany exports to south EU but China surely doesnt have a higher living standard as you already know. Recycling can take several forms.They can finance the other states’ imports or they can invest the money so as to generate wealth at those deficit regions.Prof. Varoufakis uses to give a very nice example.When Boeing tells to the Pentagon i need X billion to develop the new fighter aircraft the Pentagon oblidges Boeing to build its labs or whatever sites it will need to build,in usually deficit regions. But apart from that,actually banks didnt really lend German money to the periphery.Nowadays Banks are far from similar to the Blacksmiths or even the gold standard era banks.They dont loan deposits,contrary to popular belief,mainstream view and what we are taught at universities.But thats a whole different (and quite large) topic,i just wanted to add this aspect in my argument.You can see more here to get a basic glimpse of what im saying: http://bilbo.economicoutlook.net/blog/?p=14620. If you are selling apples to me that im buying with credit,then i can only keep buying as long as i keep getting credit.By the time my credit line is closed i stop buying and obviously you stop selling.The latest drop in German PMI,is in my opinion an exhibition of what is going to happen if EZ doesnt split paths with austerity.EZ’s credit line is closing so they cant keep on buying German apples = Germany cant keep on selling apples.And even though one can argue that Silicon Valley is small enough (which i dont know) so that if the rest of the states stop buying,it can always just increase its exports to the rest of the world,in EZ things are different.Germany’s trade is 2/3 trade with EU,1/3 trade with the rest of the world.Thats the case with most EZ countries more or less.I dont see who would be able to absorb this production if the EZ starts buying…and this also is an answer to the German argument that “instead of reducing German trade surplus (by stimulating domestic demand),the south should reduce its trade deficit (by increasing exports)”. My personal opinion is that the very design of the euro itself is the problem .It is bastardized in all possible ways.After all if we agree that trade imbalances is the problem then lets admit that these imbalances exploded right after euro was adopted. You might not realize it at 1st sight,but you are part of a “surplus” recycling mechanism.Everytime your gvt taxes you it doesnt only do so,in order to offer YOU improved services,but also in order to help poorer co-citizens of yours or invest to poorer regions of your country.You can argue that sometimes or even most of the time these investments are bad,and you could be right but thats only due to mismanagement or interests getting in the way,the general idea is still absolutely right though.Dont forget,even poorer citizens by from you,if they stop having the means to buy,you will sell less too. You can have a look at Prof. Varoufakis’ Modest Proposal to get an idea of how these surpluses can be recycled. I think we have to be careful not to focus so much on arguing our points because we might overlook that we agree in the substance. I think we are both saying that current account surpluses must be offset by a deficit in the capital account. That is why Germany, China, etc. are condemned to recycle money to those countries which have current account deficits. The question is how that can be done most effectively. Particularly since the Euro, the surplus of other countries was recycled to Greece in the form of loans, Greece used these loans for imported consumption instead of domestic investment, that imported consumption reinforced the surpluses elsewhere so that more money had to be recycled, etc. etc. Perhaps you want to take a look at these articles of mine because they say pretty much what you are saying. I have had experiences with quite a few countries which had gotten into external payment problems. The only sustainable solution I have ever seen is that the recycling (at least a large portion of it) takes the form of foreign investment. To put it simply: Greece needs new jobs which pay wages/salaries which allow a decent living standard and generate income/corporate/dividend taxes so that the state can pay for everything which society wants the state to offer. Greece does not generate enough domestic savings to finance that investment, thus it needs the savings of other countries and the recycling in the form of foreign investment is the much more effective way because foreign investment, in contrast to foreign loans, does not carry interest and does not need to be repaid and, equally important, it also transfers know-how to Greece! Please refer me to a publication by Prof. Varoufakis (or by any other Greek economist or politician, for that matter) which spells this out clearly and unequivocally. Anything which a Greek politician could take and say “this will be our plan”. The Modest Proposal is a very interesting proposal how to attack the Eurozone’s debt problem (probably the best one I have seen so far) but it has very little to do with solving Greece’s problems. Yes, interest on sovereign debt would be lowered but there are easier ways to accomplish that. Yes, there would be infrastructure financing through the EIB but that alone is not going to generate much. What would generate a lot (and some of it immediately) is if Greece became a wonderful place to do business. Then foreign investment would come quickly on its own. Since Greece as a country cannot be changed overnight, I argue in favor of Special Economic Zones where this could start tomorrow. And it should start tomorrow with the substitution of those imported products which Greece could just as easily produce on its own (such as fruits, vegetables, basic meats, fish and – olive oil!). Until Greece becomes a wonderful place to do business, the country is going to have to get its act together and make all those projects for which EU funds are waiting to be disbursed “approvable”. I have read that over 10 BEUR are waiting to be disbursed. The EU Task Force is making enormous efforts to help Greece to get those projects “approvable”. Greece should appreciate that and cooperate fully instead of considering the Task Force as part of an occupation force. “What would generate a lot (and some of it immediately) is if Greece became a wonderful place to do business. ” Ok,but what is a wonderful place to do business?A new version of China or Bulgaria, or something else?Because from what im seeing,something between China and Bulgaria is what the Troika has in mind. I agree.The only thing i dont agree with is the privitization hysteria.Im not in favor of having everything privitised.To be precise im against privitisation of strategic natural resources,HCS and so on. Yet,as i already said. we seem to disagree at the level that the problem has to be solved at.I understand people saying EU is not one country etc but this is not the case.Just because sovereign countries happen to simultaneously be optimal curreny areas (OCA),doesnt mean that whenever you have an OCA that is not a country itself,it can function differently than a country.Thats exactly the reason of our problems imho.Eurozone is not an OCA nor has it ever been one during its existance.The gold standard was something similar (fixed rates as if they used the same currency and still they didnt function as an OCA) and you already know the result. Btw reading your (interesting) blogs i noticed you pay much attention to the fact that Greece is not producing stuff etc.After deteriorating seriously in 08,the current account balance started rebounding.Last time i checked (a few months ago) the balance of goods and services without fuel was almost balanced.The only actual source of “leakage” is fuel payments and interest payments,nothing else. Of course it is a problem of the Periphery and not Greece alone (I only write about Greece because my wife is Greek). The Eurozone overall has a balanced current account. It is within the EZ that balances are out of whack and only if they are brought back into whack (in whichever form of fashion) will the cross-border recycling need calm down. What’s a “wonderful place to do business”? Well, your favorite neighbors to the North (FYROM) moved up to #22 (from #24) on the World Bank’s “Doing Business 2012 Report”. Greece moved up from #101 to #100. Despite the good ranking, I am definitely not suggesting that FYROM is a wonderful place to do business (in fact, I don’t even know it). Most East European countries (not all, of course) managed to develop themselves into good places for foreign investment. Some are even stronger today than many EZ-countries (Poland, CZ) but I am pretty sure that the living standard has increased in all of them since the fall of the Iron Curtain. Greece would be as poor as some Asian sweat shops if Greece did not add more value than those Asian sweat shops, but Greece has a lot of competitive advantages which, if employed properly, would facilitate a very, very decent living standard. 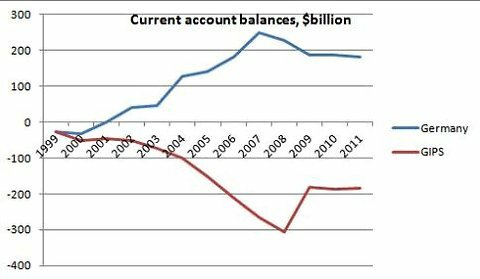 Yes, you are right that the Greek current account balance has improved enormously (I have recently posted about this). The real good news is that exports have increased so much! The trouble is the dependence on imports. The Bank of Greece has told me that imports have come down exclusively due to the recession. Obviously, if Greeks spend less money on consumption, Greece will import less. The BoG said that without structural reforms, imports will explode again as soon as growth returns to Greece. I recognize that growth it not to be “feared” this year but if and when it comes, and if imports explode again, then Greece is right back where it was in the 2000s. Since you recognize that trade imbalances are specifically a European problem,since EU has a balanced external trade, can you tell me what you believe is the purpose of this austerity (which i repeat is forced to the whole periphery not just Greece). ?Is austerity the way to fix trade imbalances? Ofcourse it can possibly lead to balanced (or way less imbalanced than now) trade but this will be due to weak demand so i cant see how the core will be unaffected by such changes.In the (not so) long term this austerity will not favor anyone.We already have early signs of this,German PMI has been dropping lately and i believe theres more to come. Maybe austerity is the way to increase competitiveness?Could be,but when everyone is trying to deflate then there are no gains.The same would happen if we had different currencies and we all tried to devalue. Thats why i believe reduced demand wouldnt solve anything.On the contrary increasing demand in areas that had weak domestic demand for years would be far more reasonable.This is like arguing on whether USA needs to reduce demand or should China stimulate its own?I obviously opt for the latter. China is a good place for foreign investment,maybe even better than these countries.Would you rather be an avg. Greek or an avg. Chinese? A look in Argentina and Latvia would clear a few things regarding internal devaluation and austerity.In both cases the recipe failed to materialiaze the results it meant to bring in the 1st place.After imports took a heavy hit just like in Greece now,national income growth didnt come from increased exports rather by domestic consumption. Ive read the BoG view on this matter too,but i have many reasons not to trust them.After all the current account correction is not only due to reduced imports,exports have increased as well. How much appetite did any country display for cuts, taxes and wage pressure during the boom? It is a lot better in theory to forswear drinking before the binge/hangover rather than during; but that rarely happens.